Todd Baxter will tell us all you need to paint on location. Painting en Plein Air lets you see and feel the light, colors and weather as the impressionists did. 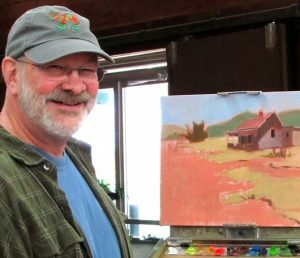 Todd will share his experiences and how to set up for painting outdoors. He will bring paintings done on location and in the studio to show how they differ. Doors open at 6:30 to meet and greet. Program begins at 7 pm. This is a free program. Visitors are Welcome! Be sure to sign up for Todd’s workshop Sat Oct 27 to paint on location. Cost $65 for SASi members, $75 for non-members.